Although I have left behind many of the teaching strategies that I relied on earlier in my career, some techniques continue to be valuable in a proficiency-oriented classroom. A strategy that I continue to implement is the use of learning stations. A recent French 2 unit on grocery shopping reminded me of the following advantages of incorporating learning stations into my classroom instruction. #1: Learning stations enable me to incorporate authentic materials in their most authentic form. While the internet gives us access to limitless authentic materials, actual concrete objects that were brought back from the target country are inherently interesting to students. They love seeing the French price tags on items that I’ve purchased and always want to know whether I’ve “stolen” items such as menus and other realia. It is often difficult, though, to procure enough of an authentic item for the entire class to use simultaneously. 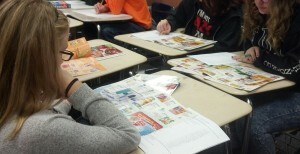 However, if I divide my class into small groups, a few grocery flyers, for example, are sufficient for an interpretive task. 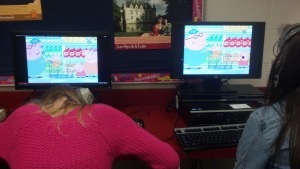 #2: Learning stations allow me to make the most of the technology I have available to me. I have eight computers in my classroom. When I divide my classes of 25-30 students into 4-5 different station groups, I am able to have my students use the classroom computers to access authentic videos for interpretive listening tasks. The students shown here are able to watch their Peppa le Cochon video at their own pace, pausing and rewinding as necessary in order to improve their comprehension. #3: Learning stations allow me to incorporate manipulatives into my lessons. 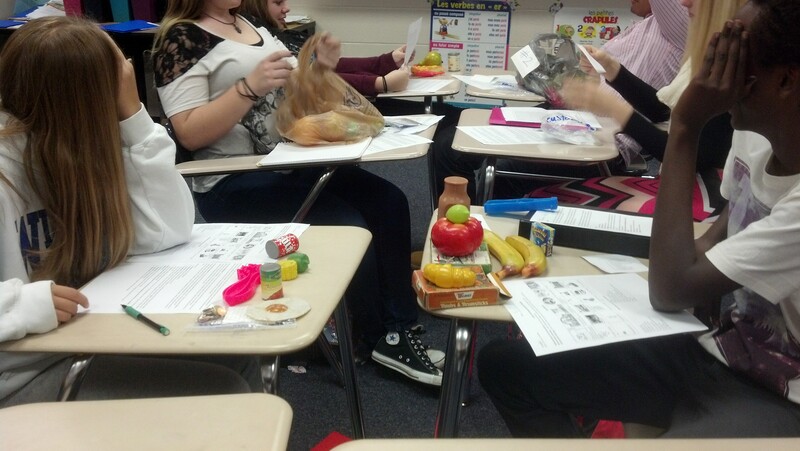 While it would be cost prohibitive (and a storage nightmare) to buy enough play food to use for these grocery store role-plays, learning stations made it possible for these students to use the play food that I do have, as well as some spare euro coins, to lend authenticity to their interpersonal task for the unit. In other units I’ve been able to use authentic and teacher-created games that would not be possible with an entire class. #4: Learning stations allow me to provide better feedback to my students. During the learning station phase of a unit, I generally position myself near the students who are either practicing the interpersonal task for the IPA. In this way I am able give the students very specific feedback on their progress, which I would not be able to do if I were circulating among an entire class who was working on the same task. By having my students write drafts for their presentational task at a learning station, I am also able to give them more detailed feedback, as I have only about seven or eight papers each evening, rather than a set of 30. #5: Learning stations give me a little breathing space. While each set of learning stations requires a lot of advanced preparation on my part, once we begin this phase of instruction, my work is basically done. There are no copies to be made at the end of the day, a new agenda does not need to be written on the board, etc. #6: Learning stations allow me to show off a little. There are many times that we need to be able to demonstrate our best practices to others. This might be for a graduate class, evaluation by an administrator, or National Board Certification. It is always a challenge to decide what those evaluators will see during the short time they will be spending in our classroom or watching us on a video. When we invite others to see our students working on learning stations, they can see how we teach all modes of communication, 21st century skills, several state standards, etc. in a single lesson. When required, we also have a lot to reflect about when a single lesson includes so many different activities. These are only a few of the advantages of using learning stations in a proficiency-based classroom. If you use learning stations, I’d love to hear the reasons why! This entry was posted in French 2 Units, Planning on October 12, 2014 by madameshepard. How long do the students spend at each station? How many days do you run these stations for the kids? I’m intrigued but wondering how to make it worthwhile. I usually design my stations so that the students will spend one 48 minute class period at each station. If they finish early they can work on Duolingo or complete one of the other enrichment activities that I make available. Let me know if you have any other questions! Do you have a list of station suggestions? It just depends on what I’m teaching. I usually have a computer station (I have 8 in my room) where the students listen to authentic videos or sometimes do vocabulary practice activities. I usually have a speaking station where I sit to provide feedback and/or assessment. I usually have a reading station where the students read authentic children’s books or realia such as menus, brochures, etc. This allows the students to actually read the materials in their original format, rather than having to photocopy enough for a class set. I often have a writing station where the students write a rough draft of their IPA prompt. Sometimes I’ll have an additional station where the students might play an authentic game (if I have one that is appropriate to the unit) or some other type of manipulative. Let me know if you have any other questions!